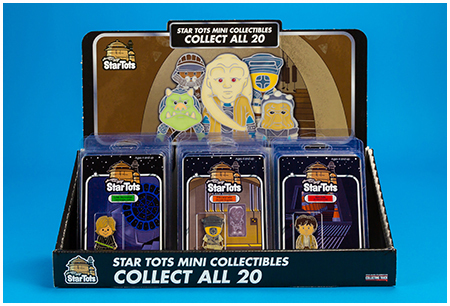 Based on Kenner's designs for a proposed pre-school line of Star Wars toys in the late 70s, the giveaway Star Tots were reimagined as diecast metal, two-dimensional character figural tokens that were packaged in resealable clamshells with individualized card backs that closely mirrored Kenner's original design. The inaugural set was based on the first twenty action figures released by Kenner. To complement the set, a special collectors display box, designed to reflect the original Kenner point of purchase store displays for their 3.75" action figure collection was also made available. When it came to the 2013's Star Wars Celebration Europe II, the Collecting Track organizers didn't have to look very far for inspiration in terms of the focus of their second set of Star Tots panel premiums, basing them on the final fifteen figures released in the European assortments of the classic Kenner Star Wars action figure collection, complete with the Tri-Logo packaging design! Once again, a display box was also produced to add that final touch. Characters from The Empire Strikes Back realized as vintage-styled Star Tots were the theme for Star Wars Celebration Anaheim in 2015, each using original designs by the creative team that leaned heavily on the classic Kenner action figures for their colors and forms. As with the previous two Star Tots sets, an exclusive display bin was produced, this one taking its influence from the rare "Collect All 32" hanger display with its striking yellow background and full-colored action figures. 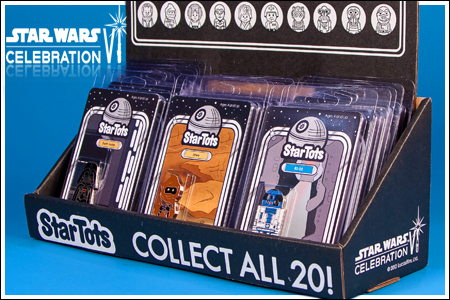 For 2017's Star Wars Celebration in Orlando, the twenty Star Tots were based on characters from Return Of The Jedi, and continued the trend of being accompanied by an exclusive display bin. 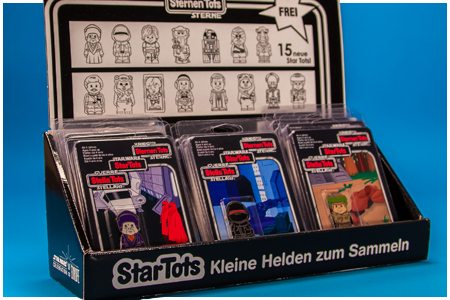 The set of Star Tots that will be given away during the Star Wars Celebration Chicago Collecting Track panels in room W474, predominantly features characters that never made it into the Kenner action figure line! Click on the thumbnail below to check them all out and view the schedules to see when they the panels are taking place.